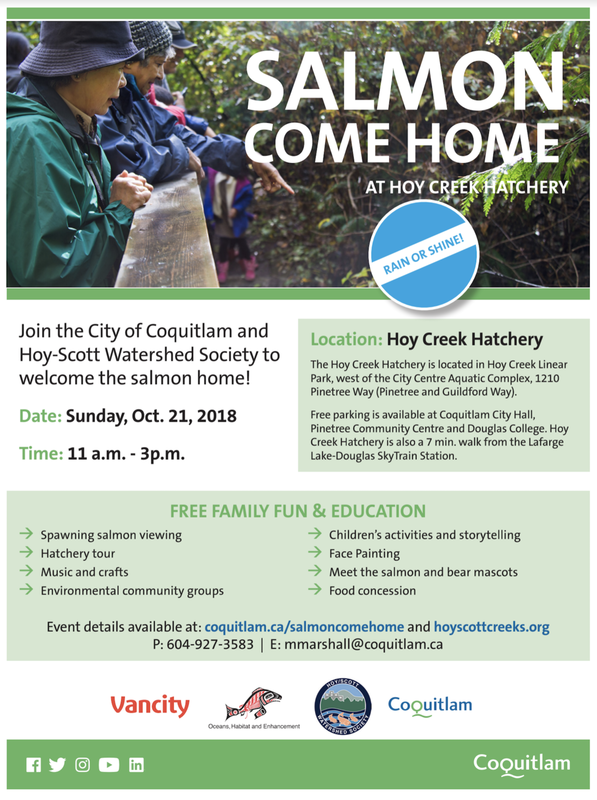 Our annual SALMON COME HOME 2018 event is set for Sunday, October 21st and is co-hosted with the City of Coquitlam. The FREE family event celebrates the return of the salmon and runs from 11 a.m. through to 3 p.m. at the Hoy Creek Hatchery. The highlight is viewing the returning chum salmon in Hoy Creek. The event features live salmon demonstrations; hatchery tours; musical entertainment; interactive children’s activities; food, and exhibits. Aside from Hoy-Scott Watershed Society, many other community groups attend and share educational information. Dress for the weather, as Salmon Come Home runs rain or shine! Read our 2018 press release. The Hoy Creek Hatchery is located on Hoy Creek Trail Linear Park, west of the City Centre Aquatic Complex at the corner of Pinetree and Guildford Way. The hatchery is a short 10-minute walk from Lafarge Lake-Douglas Skytrain station. Location via Google maps. Join our Facebook Page to keep updated, and be sure to invite your family and friends... Our event hashtag is #salmoncomehome.